Choosing a customer support tool is like looking for a new apartment: once you go with an option, you really hope you don’t have to move any time soon. You want to stick to it for as long as possible. Same applies to help desk tools. Choosing one is quite a commitment: once you have a help desk tool set up and ready to go, it’ll be hard to change anything. All your communication with customers, their data and requests together with all the analytical reports will be stored in this single place. Migrating this stuff from tool to tool isn’t just a long and painful process, it’s also risky as you can lose tons of valuable information along the way. Zendesk is indeed one of the most famous (if not most famous) help desk tool out there. It was founded back in 2007 as an alternative to old school semi-support tools that were overloaded and uncomfortable (just like everything else in 2007). From the very beginning, Zendesk positioned itself as a high-end help desk system for gathering, prioritizing and solving customers’ requests in one place – some kind of a unified tool for everything customer relationships. Help desk is great, but have you tried real-time communication? That’s what Zendesk thought in 2014 and acquired Zopim, a third-party live chat software. These days, Zendesk offers a wide variety of customer support tools on top of its help desk. The Zendesk Suite includes the following tools which can be used both together and separately. Zendesk also offers the ‘Answer bot’ for enhancing their knowledge base tools. And even though the company doesn’t have their own custom chatbot as, say, Intercom or Drift, they released their Chat Conversation API which allows integration with third-party chatbots. So why look into Zendesk competitors? Zendesk is a powerful toolset that seems to cover every customer support task or challenge your business might have. Sounds awesome, so why even look into its competitors? No chatbot of their own. With all its mightiness, Zendesk can be a little overwhelming – to say the least. It does offer an awful lot of tools and features, but in most cases, you wouldn’t need even half of them. 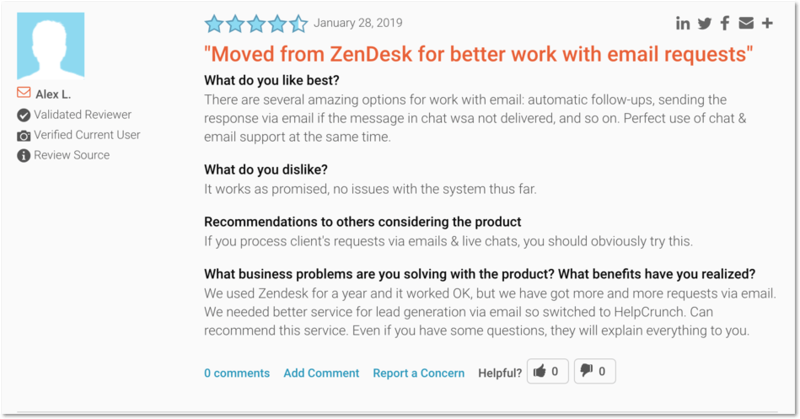 I’d even go as far as saying Zendesk may be a great choice for huge enterprises with many customer service departments, but smaller companies will feel much better choosing a Zendesk competitor. On the plus side, Zendesk does offer free versions for some of their tools. But so do its competitors, so why don’t we look into them more closely? In this list, I mostly concentrate on help desk tools, but it also includes some all-in-one services with ticketing systems. By help desk tools I mostly mean those helping your customer service team gather all user requests in one place and manage them from there. Knowledge base and live chat tools are nice bonuses. HelpCrunch is exactly an all-in-one tool with its robust toolset covering everything from live chat to email marketing to in-app messaging. From the very beginning, HelpCrunch had very similar objectives to those of Zendesk. It was striving to be the ultimate place for all customer connections. People come to your website – they see HelpCrunch live chat right away and can use it to communicate with you in real time. If fast customer support isn’t really their thing, they can shoot your customer support an email. If they’re not feeling like talking with you at all, you can nudge them with the help of HelpCrunch auto messages. And all this is happening within one simple dashboard – no disconnected tabs. Shared inbox. With HelpCrunch, you can receive all you email and chat requests in one place and manage them accordingly. 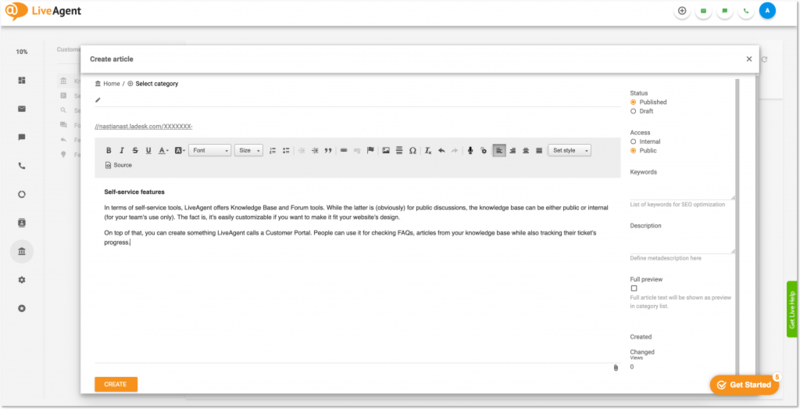 You can send emails to your customers right from an agent chat – just switch between two tabs. Real-time customer data. Your customer support agents can access any piece of information they need right in their agent chat: country, time zone, language, subscription, and unlimited chat history. Custom data. You can upload any custom data about your users into HelpCrunch dashboard – like types of subscription, registration data, account balance, purchases’ value, etc. Data synchronization. If you have several products (e.g. web and mobile apps), HelpCrunch updates all customer data from all devices in real time. Tags and Statuses. You can create as many as 512 custom tags in HelpCrunch and mark your incoming requests with them. Statuses will help you mark conversations as open, resolved, pending, etc – and prioritize them accordingly. Private notes. You can leave private notes for your colleagues right in a chat thread and they will only be visible to your team. Feature requests, additional info, work progress – everything can be added in the form of a private note. Overall, HelpCrunch does offer two important things that Zendesk is missing and those things are an in-app messenger and effective email marketing tools. If you want to communicate with your customers fast and conveniently, these two are a must. Also, HelpCrunch Knowledge Base is coming live in April, 2019. For one thing, HelpCrunch is almost 3-5 times more affordable than Zendesk. The only thing about HelpCrunch is that it’s more universal than just a ticketing tool. The tool is striving to be the only place you need to manage everything from customer support to sales to marketing, which makes its every tool very condensed and vital. See the full Zendesk vs HelpCrunch comparison here. Help desk. In a nutshell, it’s a shared inbox with necessary tools to organize incoming chats and email and manage them effectively. Docs. A knowledge base tool with a simple editor, categories and built-in SEO features. Beacon. I’d say it’s something that looks like a live chat window but mostly functions as a knowledge base assistant. It suggests relevant articles based on pages customers are viewing. Also, the ‘Beacon’ tool can include live chat. Help Scout is somewhat similar to HelpCrunch in terms of help desk functionality. It allows all the same things like a shared inbox for all incoming requests, private notes, tags and saved responses. The tool also shows you a real-time view into who’s handling a particular request at a moment. What’s cool about Help Scout though are their Workflows. They function as advanced filters and allow automating many routine customer support tasks. Basically, you can set a condition (what you’re looking for) and an action (what you want to happen based on this condition), and the system will do the job. Help Scout’s main selling point is that they are simpler. And indeed they are. Their interface and features are much easier to understand and get used to. There’s nothing confusing about their dashboard. But if you’re looking for something as advanced as Zendesk, Help Scout may be a bad choice for you. Overall, is not the most comprehensive help desk tool which is also confirmed by Help Scout’s reviews. Some report that the tool is poor in features while others say it’s overall very buggy. But they’re not trying to hide their simplicity, too. Freshdesk is probably the closest competitor to Zendesk in terms of full-scale help desk functionality. But it’s worth noting that Freshdesk is only one part of many tools offered by Freshworks. We won’t delve into their cloud-based call center, live chat, sales and marketing tools, etc. For one thing, we’re talking about help desk tools here, but also because you would have to pay for all of them separately. On the other hand, their free plan includes basic Freshchat integration, which is nice. Basically, with ticketing tools by Freshdesk you get a shared inbox (or rather multiple shared inboxes starting from the basic paid plan). The system will convert all your incoming support emails into tickets and allow you to merge, split, monitor them and get automatic notifications about any event you need. Freshdesk offers a great variety of help desk features to make your work with tickets more effective – from private notes and canned responses to collision detection and rich reports. As many other robust help desk tools, it also has automations which are automatic actions that are performed based on time and event triggers. Overall, a very decent package of features for a help desk tool. Not bad, not bad at all. Freshdesk offers a multilingual knowledge base tool, where you can create self-service articles, divide them by categories. For additional money, you can enhance it with their native Answer Bot that will automatically suggest relevant articles to your customers. Starting from the ‘Basic’ subscription plan, you can curate your Twitter and Facebook requests via Freshdesk. Just note that their free subscription only includes basic social media tools. b) it’s cheaper than the Zendesk Suite, but is totally on par with it in terms of functionality. So, if you’re looking for something as powerful as Zendesk, but not so expensive and overwhelming, Freshdesk is perfect for you. Core features: ticketing, knowledge base, forum, for additional cost – live chat, cloud call center, video calls, social support. 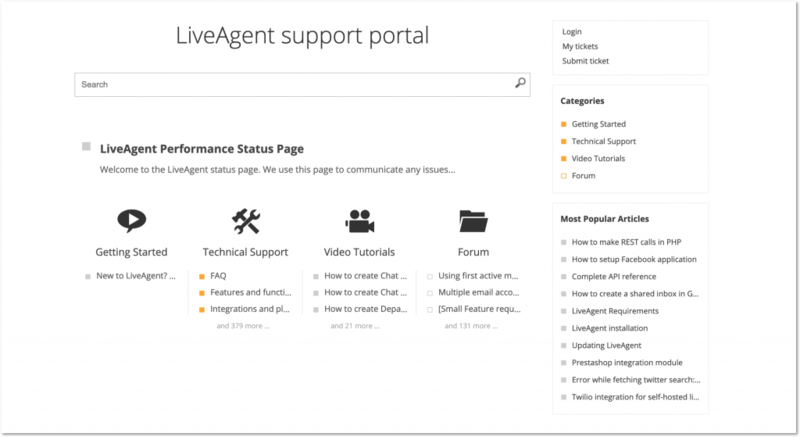 LiveAgent positions itself as a help desk tool for small businesses – that is literally what they say in the header of their homepage. As a ticketing tool, LiveAgent looks neat and clear. All your communications with customers including (or rather especially) emails land into LiveAgent dashboard where they are converted into tickets and can be managed accordingly. All standard ticketing events are available – merging, splitting, exporting, bulk resolving, etc. Just like with HelpScout’s workflows, you can automate many common ticketing tasks with the help of LiveAgent’s rules. 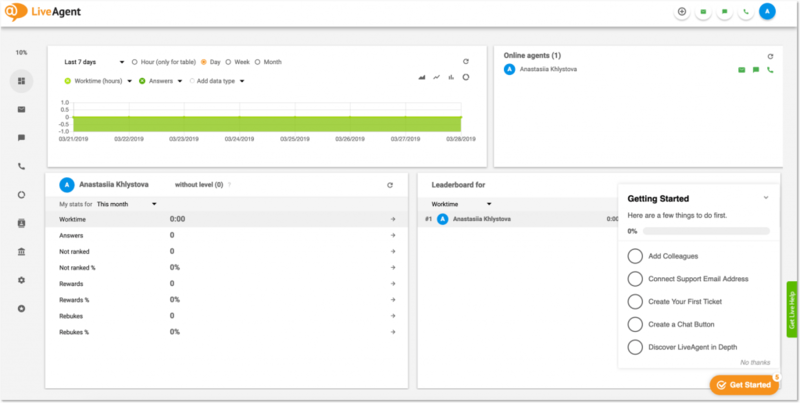 LiveAgent offers action-triggered and time rules which can be assigned to certain types of tickets automatically and perform corresponding actions with them. All you need to do is to set a specific ‘condition’ that will evoke a certain ‘action’. For instance, you can choose to automatically assign all the tickets with the word ‘payment’ in them to your sales department or set a reply to be sent after a certain period of time. In terms of self-service tools, LiveAgent offers Knowledge Base and Forum tools. While the latter is (obviously) for public discussions, the knowledge base can be either public or internal (for your team’s use only). The fact is, it’s easily customizable if you want to make it fit your website’s design. On top of that, you can create something LiveAgent calls a Customer Portal. People can use it for checking FAQs, articles from your knowledge base while also tracking their ticket’s progress. A great addition to everything that LiveAgent has to offer is the fact that they provide 24/7 customer support for all of their users, but only via email. Live chat support is available during business hours. If you go with the ‘Ticket + Chat’ pricing plan by LiveAgent, you will have to pay $29/month. For this price you’ll get live chat, ticketing, and knowledge base tools. All of them are fully functional – no limitations and stripped down features. If you’d need all the same tools by Zendesk, you would have to go with either the Zendesk Suite for at least $179/month, or try to combine them one by one. For instance, if you go with their ‘Support’ (aka help desk) plan for $9/month, it will include free versions of a knowledge base and live chat. But they will be very limited and you’ll have to pay additionally for every additional feature. In addition, LiveAgent’s self-service tools are extremely customizable and they offer this Customer Portal tool – something that no other help desk tools don’t really offer. What immediately drew my attention after I signed up for Groove’s free trial is their clean and simple dashboard. And I mean it in the best possible way. It’s not overloaded with redundant tools and features – everything is within a few clicks. On the ‘Starter’ subscription plan which costs $15/agent/month, you get access to one Shared Inbox, standard Knowledge Base tool, and 30-day Reports. Shared inbox is basically how Groove calls their help desk tool and the package is rather standard here: you can assign tickets, tag your colleagues and leave private notes for them. There are canned responses, tags, statuses available at your disposal. And if you go with the ‘Business’ subscription for $25/month, you’ll get workflow automation rules. An additional goodie to Groove is that their inbox is real time. You won’t have to update your page to see new information in it. 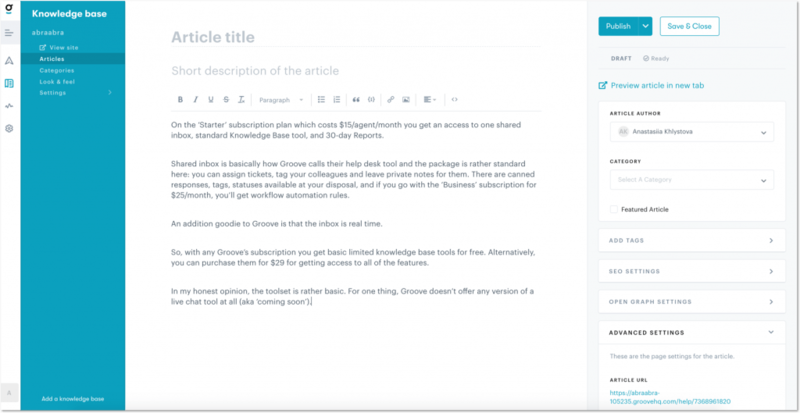 With any Groove’s subscription, you get a basic (aka limited) knowledge base for free. Alternatively, you can purchase its more advanced version for $29 and get access to all of the features. In my honest opinion, the toolset is rather basic. For one thing, Groove doesn’t offer any version of a live chat tool at all (aka ‘coming soon’). But it makes it way more intuitive than any other Zendesk competitors. So yeah, it is indeed a great help desk tool for SMB. Obviously, Groove is easier than Zendesk as it doesn’t offer as many features and offers and easier admin panel. But then again, almost every help desk tool is easier than Zendesk. Groove is easier for smaller team, while Zendesk is crafted for big teams with many departments. The most peculiar thing about HappyFox is that you can’t really just sign up for their trial or create yourself an account. Their pricing is also nowhere to be found. All you see on their website is the button ‘See a demo’ and that’s it. In all honesty, their website is a mess. *Gasp* So I couldn’t sign up for HappyFox free trial, so the following is what I was able to learn from their website. From what I understood, all HappyFox’ subscription plans offer unlimited tickets, automation rules, and knowledge base tools. That’s a good thing. On the downside, you won’t really be able to pay $39/month, because that is the cost of one agent while HappyFox requires you to purchase at least 3 agent seats to get started. Call center and live chat integrations. I’ll tell you this: HappyFox is not my favorite Zendesk competitor in this list. Their website is too confusing for me and I wasn’t even able to test their tool as per standard free trial. Additionally, HappyFox’ pricing policy is not tailored for startups and SMBs – you can’t subscribe to their software unless you have 3 agents. Given that you pay on the ‘per agent’ basis, your costs will be quite high. On the plus side, HappyFox’ customers report that HappyFox is extremely flexible and easy to adjust in accordance with your customer support needs. Zendesk, being a huge feature-packed tool, may lack this flexibility in many cases. What’s really nice about Kayako is that their live chat and help center are included in all of the subscription plans. It makes the whole customer support process more all-encompassing and universal. Kayako is an omni-channel help desk tool which means that all email, chat and social media requests will land into its unified dashboard. It also gives you a full view into your customers’ journey. Visits, purchases, shipping history – every interaction they had with your website or product is displayed in a single window. There are automations and standard team collaboration tools at your disposal to assist your agents with their work. 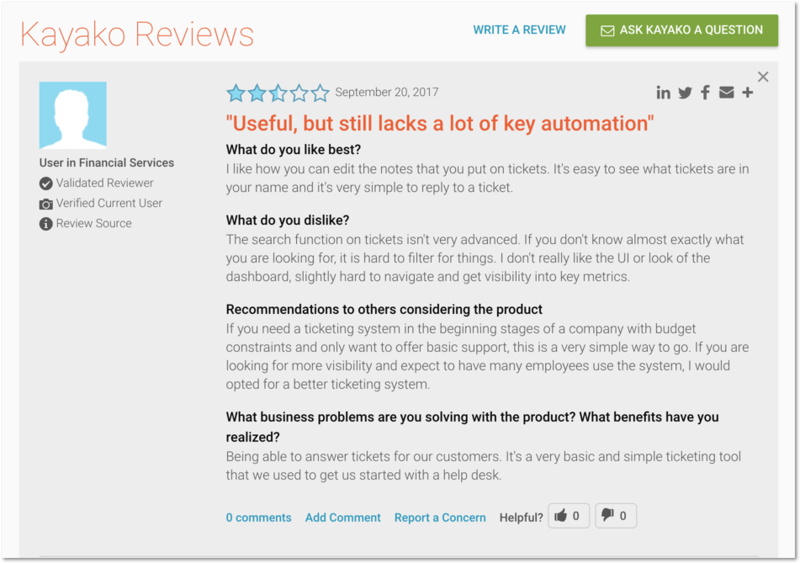 According to some of Kayako’s reviews on G2Crowd, it’s not your most robust help desk tool out there. It’s rather limited in features in comparison to other Zendesk competitors. Also, many users report that Kayako’s customer support has always been a huge downside for them. And yeah I left a request in their live chat myself trying to find their monthly prices. For no luck. 8. Intercom – messaging-oriented Zendesk competitor. Intercom is also rather an all-in-one tool which offers live chat, in-app messenger, email marketing tools and a knowledge base. As in other universal customer support tools, help desk features are rather complementary in their toolset. It does have one thing that Zendesk’s seriously missing and that thing is their in-app messenger. 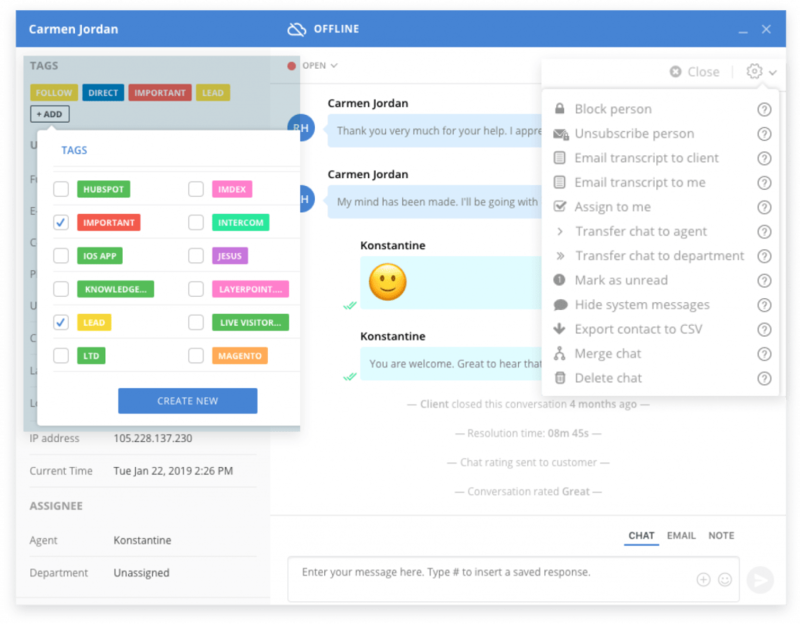 In terms of help desk tools, the package is rather standard: a shared inbox for chats and emails, customer data and activities, tags, notes, mentions. Intercom also has a very decent knowledge base tool and the ‘Operator’ bot for it. 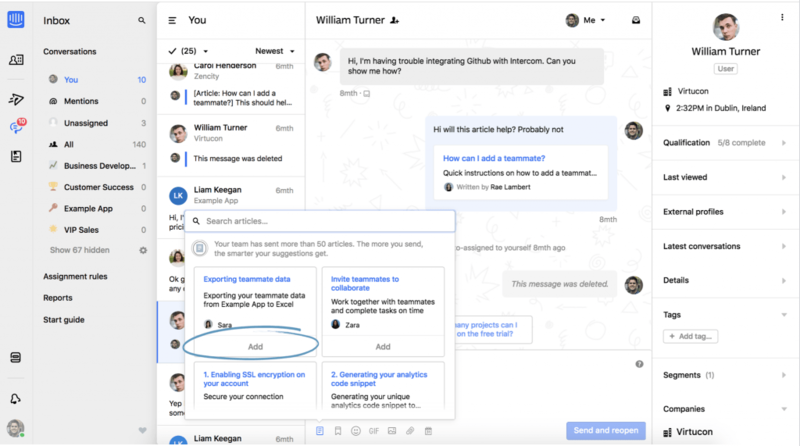 At the very last, Intercom offers their own native chatbot, which is a very popular and high-demand feature these days. All in all, Intercom is not your most comprehensive help desk tool if you’re looking for a pure ticketing system. But as an all-in-one tool, it has lots of tools and features to offer. On the other hand, everything in Intercom costs a lot. Like, if you want to get yourself their ‘Articles’ tool (aka knowledge base), be ready to pay at least $49/month additionally. Bots are even more expensive. Its main downside is its pricing, which is not fixed and hard to predict. You would have to pay not only for agents, but also for contacts in your database. Intercom is way more universal in terms of customer service tasks than Zendesk. It has great features for everything from support to marketing to sales. Which can also be a downside for some users. If you’re looking for a help desk and don’t need all the fancy bots and apps, Intercom may easily overwhelm you. But then again, customer service is changing and evolving, so I don’t see a single reason why companies would stick to old school tickets and outdated systems. And in my opinion, Intercom beats Zendesk in the usability department, both on agents and customers’ side. Though Zendesk is indeed a great help desk tool, it has many excellent yet more affordable alternatives worth your attention. If you’re a small business and looking for a more condensed set of features, you definitely should look into software like Groove or LiveAgent, while HelpCrunch and Intercom are more universal in terms of customer service tasks. If your goal is having more help desk features, you’d probably be satisfied with Freshdesk and Kayako. Help Scout and HappyFox made an impression of rather simple and not overly complicated tools. The choice is yours.